Julia the Plumber has a home-based business. She has a separate office at home where she does bookkeeping, receives calls from customers and vendors, and where she does other work related to her business. She also writes bills and does some administrative work in her car at the homes of customers. How about Roberto, who works as a salesperson, traveling from his home office to client offices? He has a small office at his employer's site, but he rarely uses it. The employer requires him to maintain a home office in his territory to get to client sites more quickly. What is the principal place of business for Julia and Roberto? Understanding the concept of "principal place of business" is an important issue, because you can only deduct expenses for business use of your home if your home is your principal place of business. 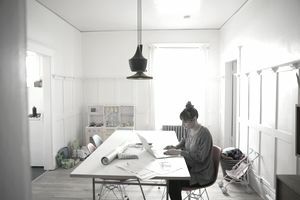 If you work from home running your business (not as an employee of someone else), and you have no other business location, your home is your principal place of business. You use it exclusively and regularly for administrative or management activities of your trade or business. It means that the location at your home where you run your business is used exclusively and regularly for this purpose. You have no other fixed location where you conduct substantial administrative or management activities of your trade or business. You may, however, do some administrative or management activities outside your home (in your car, for example), or someone else may do administrative work for you outside your home (a bookkeeper, for example). (b) she has no other place where she does most of her administrative and managerial work. The IRS has a handy little flowchart to help you figure out whether your home business qualifies for tax deductions. Unfortunately, the flowchart doesn't help when you get down to the question "Is it [your home] your principal place of business?" Unless you know what the "principal place of business" means, you can't use the flowchart.